A dental clinic takes care of oral health, but like other businesses, it too requires marketing plans and promotion for its growth. Plenty of clinics are already operating in a city competing each other which creates a fierce competition for a new venture in this field. So, a catchy but simple and unique name of the clinic is the first key step to drive patients’ attention. While the purpose of running a dental clinic is to serve the people, the clinic also has to be run like a business to help it grow so that it continues to serve. This is where the name of new dental clinic matters. A unique but simple name of the clinic helps in driving the patents’ attention. We can say that the name of a new enterprise like a dental clinic can be a factor in its growth. A creative name of your clinic can draw the attention of people and the patients. If the name stands out, the clinic also looks different than its competitors in the vicinity. It also helps in building good impression of your dental practice. With the right name of your dental practice, promoting your expertise becomes much easier. Also, do not name your clinic’s name in a hurry by just picking any casual name that sounds similar to other clinics. Usually, some businesses make such mistake which you shouldn’t repeat. Business name ideas for the dental clinic are many. Here are some of the names you can safely pick to give your new dental clinic some brand value. Any name that you choose for your dental clinic should tell about your practice. This is a way to let patients know what they are searching for on the web or in a market when suffering from a dental problem. Make sure that it highlights your specialty as a dentist. Such a name is even more vital if you specialize in a field of dentistry such as endodontics, sedation dentistry, cosmetic dentistry, pediatric services, or emergency services. With such a name, you can eliminate all guesswork for the patients. They can pinpoint your service when they suffer from the dental issues that you can treat. Also, note that the name is most likely to appear on your dental clinic logo design, which means the logo itself will tell about your specialization. Looking for a dental logo design? Although it is not something binding on you while naming your dental clinic, adding your locality name can help patients finding where to go for your services. For example, a name like Riverwoods Oral & Maxillofacial Surgery states that the clinic is located in The Riverwoods, which is in Provo, UT. With the locality added, not only the patients can easily search your clinic physically, but they can also access it online. They can type the city and the area, and Google algorithms will let the users know where exactly the clinic is located. So, including some keywords related to the locality is a smart move. Personal branding is all about establishing your reputation and name in the market of dentistry. Many dentists use their famous name as a way to brand them. They write their full name and then follow it with DMD or DDS. This way, people can immediately recognize you as an expert dentist. You should surely consider using your name as your clinic name if you come from a family of dentists in the same vicinity. But avoid using this tactic if you are not a well-known dentist. When your dental surgery logo includes your name, it helps people and patients know your expertise quickly as the logo will be seen on your prescriptions, clinic signboard, and marketing campaign. In any business, the target audience is the key to building a brand successful. This applies to your dental clinic as well. When looking for a suitable name for the clinic, make sure that it targets your patients. This is because you may be running a dental clinic that every patient does not require. For example, if your dental clinic may cater to children. In that case, it may not be useful for an adult person. Similarly, highly expensive concierge dentistry is not going to bring customers from middle-class families. So, choose a name that speaks to your target audience. Remember, your logo designer will use colors, fonts, and other elements considering your audience in mind to create your clinic logo. A good strategy for appeasing your audience is to consider their feelings. When it comes to picking your dental clinic’s name, express some feelings of your patience. For example, if you add the word ‘smile’ in the name, people will associate with the good condition of teeth after the treatment. A clinic named ‘The Painless Dentist’ or ‘Happy Family Dentistry’ is bound to make the target patients happy. Do not forget the fact that most patients fear a dentist because the pain and anxiety involved for them in the treatment. But some words for emotions and feelings can assure them that everything will be ok for them. Sometimes, a wordplay can be useful to come out with unique business names. Use some rhythmic words to catch the attention. For example, Gentle Dental is a catchy name with two similar sounds. With such names, your patients can quickly identify your dental clinic, and they can share the name with their peers. The idea here is to have some fun with your clinic’s name so that it stands out. Another advantage of such a name is that it can accommodate your clinic’s future growth. Even if your dentistry business grows and expands over the time, you can still keep the same name without making any alteration. Also, you do not have to look for new graphic design ideas to create your new logo as you continue with the old clinic name. Your dental clinic name should preferably be simple so that people can pronounce it easily. For example, when people need services of a teeth care, they think of names such as Aquafresh. This is because this name is simple and they can remember it easily. Such names leave a good impression of your clinic. But make sure that the name is inviting and warm. Would you like to add some slogan to the name of your dental clinic? That is a great way to convey your brand message to the people. You should think of a tagline especially when your name is too simple and routine. A slogan can put some life into the name. For example, William Dental: Happy Family Dentistry is a great name with a tagline. Make sure that you ask a professional graphic designer to include the slogan in your logo and other marketing materials. Do not consider a name without checking it for its legal implications. It should be legally your clinic’s name. So, make sure that some other clinic does not already take it. To check it, you should visit the website of the Secretary of State if you are doing business as a proprietor.You should also check Doing Business As listings to confirm that the name is legally available. Visit the website of the United States Patent And Trademark to find if you can register the name and your logo as your trademark. If the name is already registered, try some other from your shortlist. Would you like to put your dental clinic on a website? That is essential to drive patients from the web as they will first search the clinics in your locality. The website will also feature your services, specialty, costs, contact information, appointments, etc. But you need to register your clinic name as a domain name which will be the web address of your dental business.Remember that a proper domain name of your clinic also helps in building your clinic’s brand identity amongst your target audience as they search your business mostly online. So, these business name ideas for your dental clinic will help you in finding out the right name. Make it sure that you give a lot of time and have patience while brainstorming to get the best name. The next step after naming your clinic is to make it visually appealing when you promote it through various means. You will need a logo, brochures, website, business cards, and many visual identities for business promotion. At this stage, you can rely on Designhill, a prominent platform for creating various design solutions. Your dental clinic name should be a simple but unique name that speaks for your specialty, locality of the clinic and your target audience. 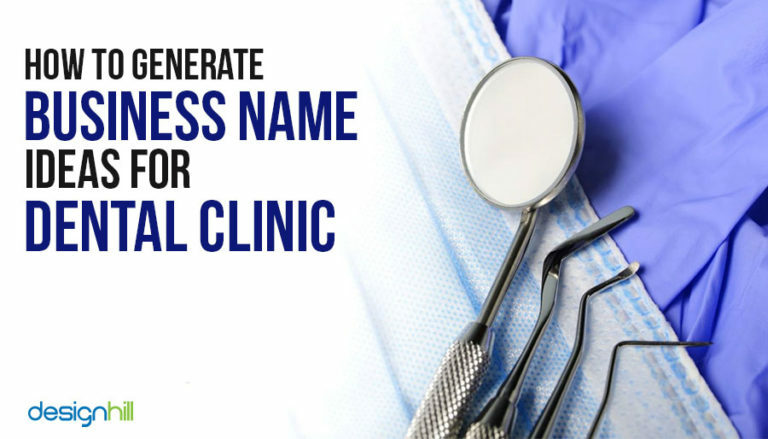 Here are some key points to consider naming your clinic.